I am pretty sure Thanksgiving is my favorite holiday to cook for. When I am planning what to make for Turkey Day (in addition to turkey, of course) I want to make something that tastes like home…if that makes sense. But I also want to make something that stands out from the rest of the childhood favorites on the table. If your family meal is anything like ours, the chances are it is extremely carb heavy. So, I decided to create a veggie dish that would be subtle enough to blend in with the rest of the meal, but different enough that everyone will want the recipe. If I do say so myself… I nailed it with this Fall Veggie Hash. While it still has the requisite carbs, it tastes fresh and light…and has a sprinkling of green to make you feel better! A note about using spreads in place of butter: A little fact about my kitchen. I NEVER have real butter in my kitchen. For as long as I can remember, I have always had a spread in my fridge in place of butter. I cook with them, bake with them, I do everything that calls for butter with them. More often than not, the spread in my fridge is I Can’t Believe It’s Not Butter Light. So when the opportunity came to write about cooking with a spread, I was happy to do it. 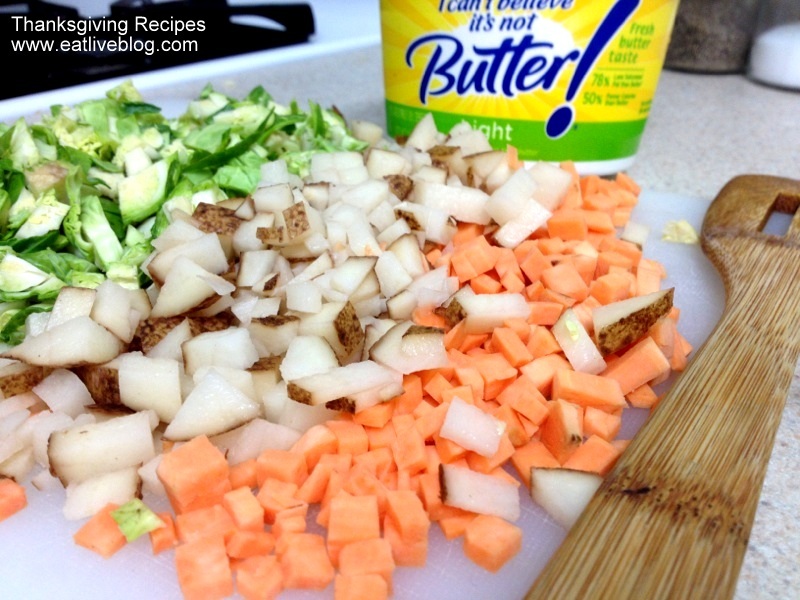 I think it is such an easy, painless way to cook just a little bit healthier. Cook over medium-high heat with the lid on for 5 minutes, stir, add remaining tablespoon of I Can’t Believe It’s Not Butter and cover again with lid. Cook, covered, for an additional 5 minutes. Salt and pepper to taste. Add the remaining hot sauce if desired. Add the cooked bacon if using. Enjoy alongside your Thanksgiving meal! 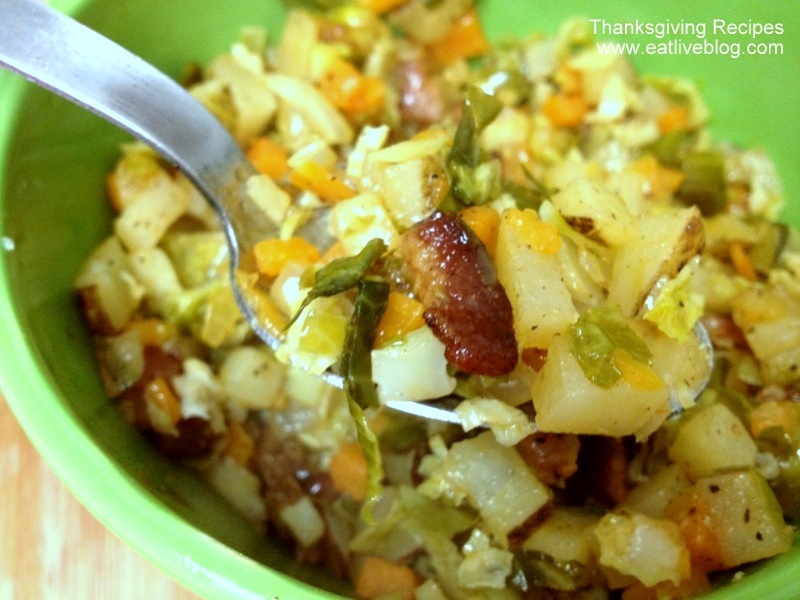 Serve over your mashed potatoes, turkey, stuffing…over straight from the spoon…. 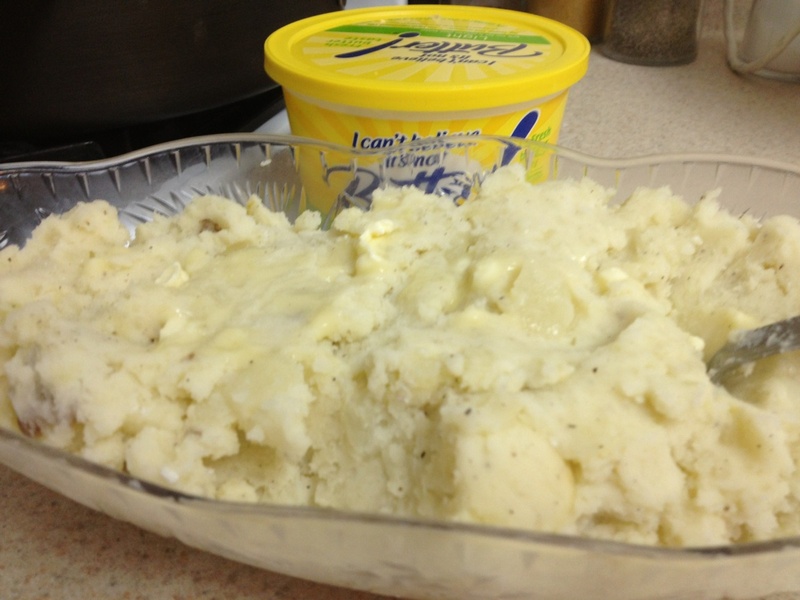 This entry was posted in Recipes and tagged gravy, hash, lighter, mashed potatoes, recipe, side dish, side Dishes, thanksgiving, vegetable by reneeh. Bookmark the permalink. I love Thanksgiving, too! Hard to believe it’s almost here. Everything looks great. I’ve been making veggie hashes lately, usually with leftovers from the fridge, but you’ve inspired me to add some brussel sprouts to the mix. It’s always good to throw in a few more greens! Yum! I like that this hash is a bit lighter. I’d love that! 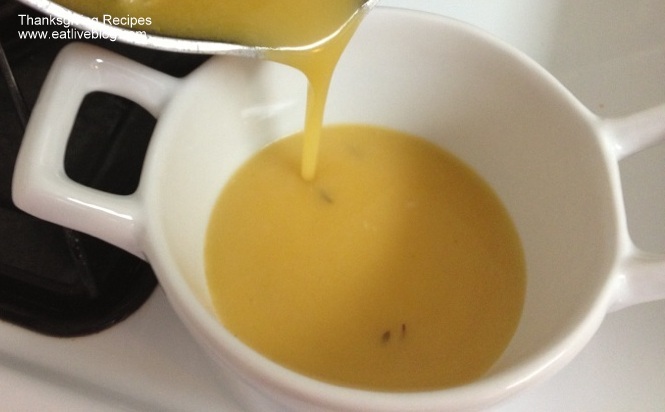 I definitely eat homemade turkey gravy with a spoon — no shame there! The veggie hash looks great!